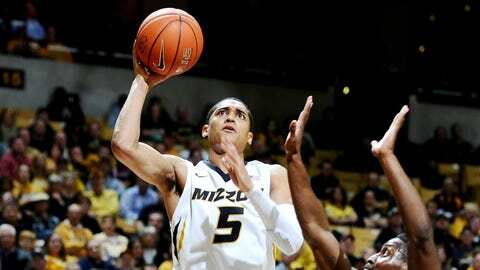 Jordan Clarkson is exceeding expectations down in Columbia for the 9-0 Tigers. The 21-year-old from San Antonio is proving to be even better than advertised, and he came to Columbia with quite a billing. Clarkson led Tulsa with a 16.6 scoring average before he transferred after his sophomore year and turned heads in Missouri’s practices last season with regular battles against Phil Pressey. "Has he exceeded my expectations," Haith asked, repeating a question from the media at his weekly presser Wednesday. "I knew he was pretty good but he’s done some really good things, there’s no denying it. He’s a very talented kid." Haith, after all, sought after Clarkson after he left Tulsa and watched him practice against the Tigers last season. In his share of those sessions, Haith says Clarkson was the best player on the floor. Still, you know what they say about practice. Haith wasn’t sure how Clarkson would adjust to competition that, on most nights, is a cut above what he faced in Conference USA. For example, a 20-point game against Western Michigan Sunday night at Mizzou Arena and Clarkson will become the first player with six consecutive such outputs since Anthony Peeler in 1991-92. Seven years have passed since any Tiger turned in five straight 20-point outings, that being Thomas Gardner. Keep it up and Clarkson could become the first Tiger to average 20 since Kareem Rush in 2000-01. "Clarkson is very, very special," Alford said. "He’s getting a lot of interest, and he should. He’s a very talented point guard." "Guys like him really benefit from the way they’re calling the game now," said Huggins, referencing the emphasis this season on calling hand-checking. "He’s got good length and he’s very good with the ball." "We’re ahead of where we were this time last year defensively," Haith said. "We can change defenses, we have good length, we’re rebounding and we’ve taken away the 3-point line. Those numbers are to our liking."